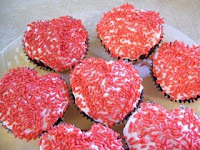 I have been making these heart-shaped cupcakes for many Valentine's Days now. I make them in regular cupcake pans but slide a marble between the lining paper and the pan prior to baking. I posted step-by-step instructions on the process and frosting tips on Instructables.